With fine leaves and a graceful weeping habit Acacia linifolia is commonly called the Flax-leaved Wattle. 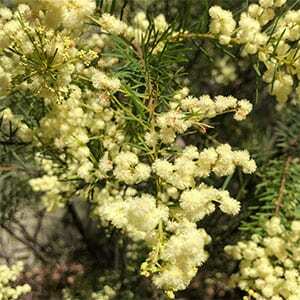 Originally from the areas around Sydney and the Blue Mountains, this is a medium sized shrub to small tree with attractive cream coloured flowers in summer as well as in the winter months. Growing well in full sun to part shade Acacia linifolia makes a useful garden plant, either as a background tree or as an informal screening plant. It does require good drainage however it is a species that requires some moisture. It is a plant with an open airy growth habit and looks good next to ornamental ponds and streams. Plant in a well drained soil preferably with some light shade or afternoon shade. Water deeply during very dry summers, especially the first few summers. Maintenance is minimal, the removal of any dead or damaged wood is the exception. Common Name – Flax-leaved Wattle or Flax Wattle. Soil – Well drained loam to sandy loam with some moisture over summer. Height – Will reach 2 – 4 metres depending on conditions. Spread – Will spread to around 3 metres in good conditions. Flowering period – Summer and Winter. Flower colour – Pale lemon yellow.